30/08/13 -- Soycomplex: Beans and meal were mostly lower in light pre-weekend consolidation. In line with recent comments on here, Benson Quinn noted that "Over the last two years, November futures have peaked into new contract highs right around Labor Day and then turned sharply lower on harvest off take." The market is nervous that the same is going to happen again this year, they say. That all depends on weekend rainfall totals. The USDA announced 110 TMT new crop US beans sold to China in routine business. Today was first notice day for Sep 13 contracts. As expected there were no deliveries against beans or meal. There were 651 deliveries against soyoil. Oil World forecast a record world oilseeds crop in 2013/14, including 282.5 MMT of soybeans, an increase of 6% on 2012/13. The IGC were a bit less bullish, cutting their forecast for world soybean production in 2013/14 by 4 MMT from last month to 280 MMT, although that's still also a record. World 2013/14 soybean stocks are likely to expand for the second consecutive year, up by 22%, they said. Macquarie estimated US soybean yields at 41.4 bu/acre versus a previous estimate of 42.2 bu/acre and the USDA's estimate of 42.6 bu/acre. Morgan Stanley estimated US soybean yields at 42.1 bu/acre. Rabobank predicted soybean plantings in Argentina and Brazil to rise 5-7% this year, in line with other private estimates. Recent dryness in Argentina will favour soybean plantings over corn, whilst in Brazil the falling Real will also encourage soybean sowings versus corn, they said. They forecast CBOT soybean prices at USD13/bu at the turn of the year, falling slightly to USD12.50 by Q2 of 2014. These are above the levels they were predicting in July. Following yesterday's weekly export sales report, cumulative soybean sales now stand at 52% of the USDA forecast for 2013/14 versus the 5 year average of 33%. The weekly crop condition report from the USDA will be delayed until Tuesday. The trade is expecting to see a fall in soybeans rated good excellent of maybe as much as 4-6 percentage points following a week of hot and dry weather in much of the Midwest. The latest Commitment of Traders report shows funds adding 38,194 contracts to their net soybean long in the week through to Tuesday night, bringing their total net long position to 138,182 contracts. Sep 13 Soybeans closed at USD14.24, down 6 cents; Nov 13 Soybeans closed at USD13.57 1/2, down 11 cents; Sep 13 Soybean Meal closed at USD468.20, up USD0.80; Sep 13 Soybean Oil closed at 43.89, up 11 points. On the week that puts Sep 13 beans up almost 75 cents, with meal gaining nearly USD38 and oil adding a more modest 31 points. Corn: Corn was narrowly mixed ahead of a long weekend that contains hopes for a chance for showers in the northern and eastern Corn Belt. The European Commission cut sharply its forecast for the EU corn crop from 70.9 MMT to 65.8 MMT. In contrast, the IGC added 3 MMT to it's forecast for the global corn crop to come up with a figure of 935 MMT, a 10% increase on last year and a record volume. Demand is seen rising 5% in 2013/14, they said. "Including a steep recovery in the US, world closing stocks are forecast to increase by 24% year on year; exporter stocks look set to be ample," they added. The jury is still out on US corn yield potential this year. Commodities Weather Group (CWG) estimated yields at 158.1 bu/acre, whilst down from a previous estimate of 159.5 bu/acre, that's still well above the USDA's forecast of 154.4 bu/acre. Macquarie estimated the US 2013 corn yield at 155.5 bu/acre versus a previous estimate of 158.0 bu/acre. Morgan Stanley also estimated yields at 155.5 bu/acre. The US corn harvest is well under way in the south, and moving forward in southeastern Arkansas, with some big yields being reported. Following yesterday's weekly export sales numbers, cumulative US corn sales for 2013/14 now stand at 36% of the USDA forecast for the season versus a 5 year average of 25%. The trade is thinking that the USDA may cut corn good/excellent ratings by 2-4 percentage points in Tuesday's crop conditions report. Rabobank said that "a bearish price outlook (on corn) is maintained, although downside expectations have eased" on US dryness issues. They now see Q4 2013 CBOT corn prices at USD4.75/bu, falling to USD4.60/bu in Q1 of 2014. "Without further production setbacks, the strength in futures in 2H August 2013 is likely to be short-lived," they cautioned. The USDA's next WASDE report, due Sep 12 will be "critical" they said. The latest Commitment of Traders report shows funds decreasing their net short position in corn by 34,350 contracts for the week through to Tuesday night. That still leaves them sitting on a total net short position to 57,428 contracts however. The German Ag Ministry estimated their 2013 corn crop at 3.99 MMT, down 27.6% from a year ago. The Buenos Aires Grain Exchange say that the Argentine corn harvest is over, producing a crop of 24.86 MMT, a 3.3 MMT rise on last year, although well below the official Ministry forecast for production of 32.1 MMT. Sep 13 Corn closed at USD4.95, down 2 1/4 cents; Dec 13 Corn closed at USD4.82, up 1/2 cent. That puts Sep 13 barely changed on the week - down half a cent - with Dec 13 up 12 cents compared to last Friday. 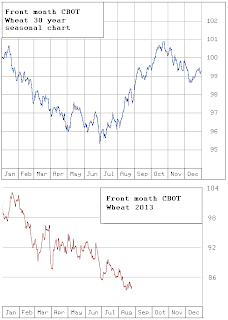 Wheat: Wheat closed mixed, looking to corn for direction but not finding any. Chicago wheat weekly export sales from yesterday were once again disappointing at only 48 TMT. Without China, sales of Chicago wheat look like they are going to struggle on the export front. Sales of HRW wheat are holding up on the back of "traditional" demand, plus the added bonus of fresh interest from Brazil. Overall, cumulative US all wheat sales however still stand at 51% of the USDA forecast for the 2013/14 season versus a 5 year average of 41%. The IGC increased their forecast for the world wheat crop by 4 MMT to 691 MMT. "Only a small increase in carryover stocks is expected in 2013/14, to 176 MMT, including a slight recovery in the major exporters; those in the US could shrink to a six-year low," they added. They forecast China's wheat import needs at 7.2 MMT versus the USDA's prediction of 9.5 MMT. There's talk of China being in the market for 150 TMT of Australian wheat to add to the 1.5 MMT of that origin that they already have on the books. A report on Reuters suggests that Australian farmers are reluctant sellers due to fears of weather damage in the east of the country and hopes that this new demand from China will push domestic prices higher. The German Ag Ministry estimated their 2013 wheat crop at 24.9 MMT, up 11% from a year ago, saying that the harvest there is almost complete. The Russian grain harvest now stands just shy of the 60 MMT mark off 53.5% of the cultivated area. Wheat accounts for 39.1 MMT of that, with yields averaging 2.84 MT/ha, well up versus 1.99 MT/ha in 2012 and not too far short of the 2.93 MT/ha average from 2011. Egypt's supplies Minister said that they will only need to import 5.0-5.5 MMT of wheat in 2013/14, which is far less than normal and would probably use up just about all their surplus stocks. There's talk of India re-entering the world wheat export market as a tumbling rupee potentially makes global prices in USD terms a more attractive proposition to the government. Rabobank said that the global wheat price outlook remains bearish. They forecast Q4 CBOT wheat prices at USD6.15/bu, falling to USD6.00 in Q1 of 2014. That's around half a dollar below where the Dec 13 future currently trades. The global wheat harvest has managed to avoid any major disasters so far in 2013/14 and production downgrades to some Southern Hemisphere crops "will likely be (of) limited consequence for the global wheat balance sheet," they said. Sep 13 CBOT Wheat closed at USD6.43 1/4, up 2 cents; Sep 13 KCBT Wheat closed at USD7.00 3/4, down 1/4 cent; Sep 13 MGEX Wheat closed at USD7.20 1/4, down 4 cents. For the week that puts Chicago wheat up 8 3/4 cents, with Kansas 5 1/4 cents higher and Minneapolis 4 cents firmer. 30/08/13 -- EU grains closed lower Friday, pressured by a pre-long weekend sell off in the US as weather models call for a good chance of rain for much of the Midwest, coupled by a significant cool down for the early part of next week. London wheat closed with both Nov 13 and Jan 14 down GBP0.25/tonne at GBP157.50/tonne and GBP159.75/tonne respectively, whilst Nov 13 Paris wheat closed down a euro at EUR187.25/tonne. For the week however that still leaves both posting modest gains, with London wheat up GBP0.75/tonne and Paris wheat EUR1.75/tonne firmer versus last Friday. There's a feeling that a lot rides on this weekend's advertised weather event in the US to decide where corn and soybean prices go from here. And where corn goes wheat will follow. Wheat crops in France, Germany and Russia have all been revised higher this week. The German Farm Ministry today estimated wheat production there up 11% this year at 24.9 MMT. Whilst official estimates for the French wheat crop are around 36 MMT, private estimates now suggest that production could ultimately prove to be 1.0-1.5 MMT higher than that, versus a crop of 35.6 MMT last year. The quality of both the French and German crops is now said to be pretty good. Meanwhile SovEcon have raised their outlook for Russian wheat production from 50.5 MMT to 51.7 MMT, a 37% increase on 2012. FranceAgriMer today confirmed that the tail end of the French wheat and spring barley crops had now been harvested. They also increased the proportion of the French corn crop rated good/excellent by one point to 55%. Early trade in EU wheat for the 2013/14 continues at a brisk pace, with Brussels issuing 687 TMT of soft wheat export licences in the past week, taking the total so far in the new campaign to 3.9 MMT versus only 1.8 MMT this time a year ago. France may be missing out on sales into Egypt but Romanian isn't, they currently account for almost 750 TMT of the 3.9 MMT of licences issued so far, putting them in third place in the EU soft wheat export table. Germany have ousted France to take pole position with 1.3 MMT worth of licences, 200 TMT more than the French. Incidentally the UK has only applied for permission to export 2,050 MT of wheat so far this season. 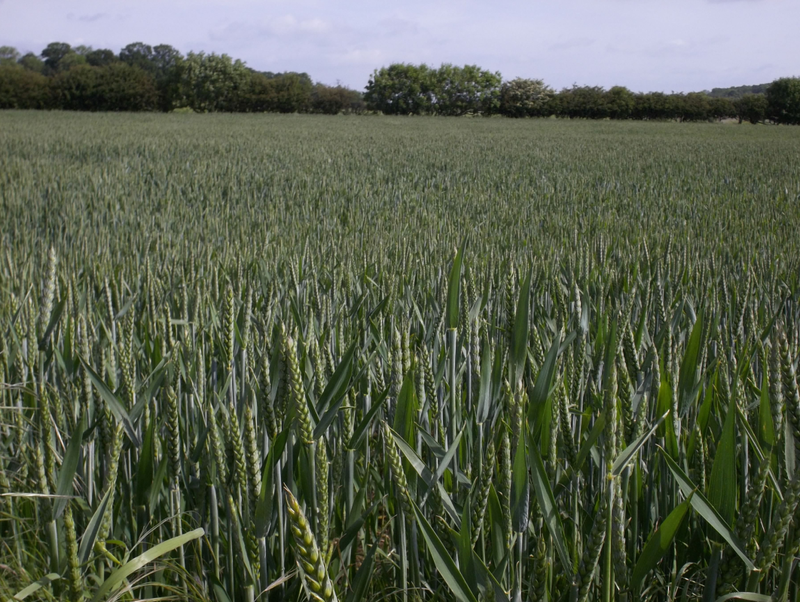 The HGCA/ADAS said that the UK wheat crop is 40% harvested, with yields marginally below the 5-year average at 7.6-7.7 MT/ha. Specific weights are averaging 76 kg/hl. The winter barley harvest is all but done at 99% complete, whist 30% of the spring barley crop is in the bin. Yields on both are above the 5-year average at 6.5-6.9 MT/ha (versus 6.4 MT/ha normally) and 5.5-5.8 MT/ha (vs. 5.3 MT/ha) respectively. The winter OSR harvest is 70% complete with yields coming in better than feared, although still below average, at 3.2-3.4 MT/ha. The EU Commission forecast production of wheat, barley and corn in Europe is expected to breach the 250 MMT mark for the first time since 2008, the HGCA note. "Against the trend of higher production, grain exports in the associated 2013/14 season are actually expected to be lower than the previous season - driven mainly by wheat but also to an extent by barley. The reduced export prospects come as a result of increased competition on the world market with both Russia and Ukraine expected to be more aggressive exporters this season," they add. Meanwhile Oil World are forecasting a record global oilseed crop of 478.4 MMT in 2013/14. They have the world soybean crop up 6% at 282.5 MMT, the world OSR/canola crop up 3.5% at 64.8 MMT and the world sunflower crop up 13.2% at 40.2 MMT. The International Grains Council today raised their forecast for the 2013/14 world wheat crop by 4 MMT to 691 MMT, a near 6% rise on last year due to increases for Canada, the EU, Kazakhstan and Ukraine. They also upped the global corn crop by 3 MMT to 945 MMT, a 10% increase versus last year. The Russian wheat harvest is past halfway at 54.9% complete, producing 39.1 MMT so far, more than last year's harvest in it's entirety. Yields are said to be averaging 42.7% more than last year at 2.84 MT/ha. The Kazakhstan grain harvest is just over 10% complete at 2.076 MMT. There's talk of India re-entering the world wheat export market following the recent sharp decline in value of the rupee. Rabobank forecast Paris wheat prices sliding to EUR165/tonne by the turn of the year, with prices eroding further in the first half to 2014 to end the second quarter at EUR150/tonne. Yikes! 30/08/13 -- Rapemeal prices on the continent are lower for a third day. Soymeal prices are lower in overnight trade, and the world's 2013/14 rapeseed crop will be a record 64.8 MMT, according to Oil World. Total global oilseed output in 2013/14 will also break all previous records, they add. 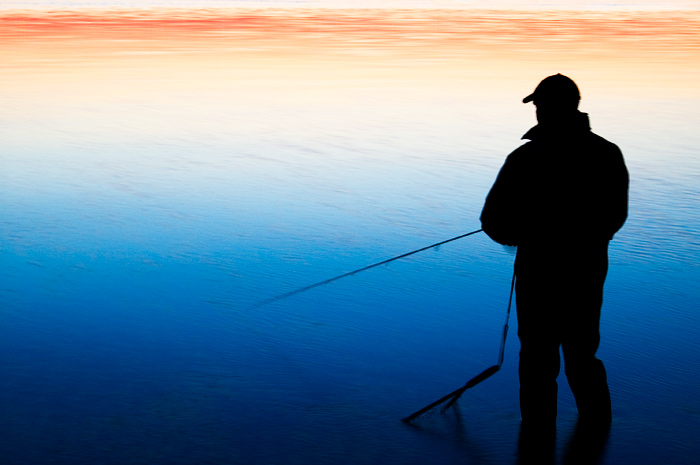 "Give a farmer a fish and you feed him for a day, teach a farmer to fish and he'll complain that it's too wet/cold/hot and dry to fish, bank his "prevent fish" subsidy cheque, buy a Range Rover and sell his fishing quota rights to the Spanish." Complaints to the usual address please! 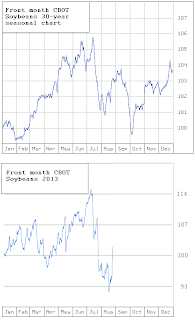 30/08/13 -- Ladies and genitalmen, today's chart d'jour is a comparison between the 30 year, 20 year and 5 year CBOT front month soybeans seasonal trend. The thing that sticks out like a Rolf Harris' didgeridoo at a High School music recital is that whilst the 20 year chart does show a degree of increased volatility when compared to the 30 year chart, in the 5 year chart the magnitude of the fluctuations between the highs and lows of the year is much greater. The highs are much higher, with soybeans typically gaining more than 20% in value (versus Jan 1st) by the summer, before ending up lower than where they started at by harvest time. (Click the chart - not the didgeridoo - to enlarge). As you might expect last year's price movements exaggerated the "normal" trend even more. If only we had a chart to show us what that looked like too, I'd think that I'd died and gone to soybean chart heaven. 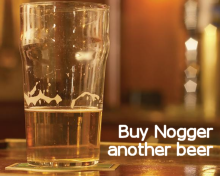 (There's one here you muppet - buy one get one free). Although we saw soybean prices rise by almost 48% versus the start of the year by late August/early September, they'd still given up a very large chunk of those gains by the time that they harvest was over. Indeed the blue line for 2012 on the chart does broadly conform to the "normal" seasonal pattern, even if the percentage movements involved are much higher than normal. Whilst we can attribute some of the blame for last year's particularly dramatic fluctuation in prices to the historic drought in the US, it is interesting to note that there does seem to be a trend developing for more volatility in recent years don't you think? 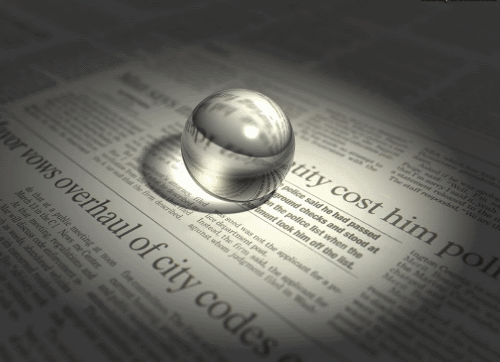 Which is where the relatively recent phenomena of much larger volumes of money than previously flooding in and out of the markets on a whim comes in. If 2013 is to be a "normal" year then right now could be a bad time to be thinking about buying soya, or any other protein for that matter, for this winter. They've done studies, you know, 60% of the time it works every time. Footnote: In 1999 the Commodities Futures Trading Commission (CFTC) deregulated the US futures markets, enabling funds to hold as large a position in the grain markets as they liked. It took a few years for hedge fund managers to realise the significance, and earnings potential, of this apparently innocuous move. In 2003 Index Funds had around USD13 billion invested in commodities futures, by 2008 that amount had risen around 2000% to approximately USD300 billion. 30/08/13 -- The overnight Globex grains are mostly red, with beans down 7 3/4 cents on front month Sep 13 (for which first notice day is today), with the rest 10-14 cents easier. Meal is down USD1.40 on the Sep 13 but USD4-5.00 easier on the rest. Corn trades 1/2 down nearby and 4-5 cents down on the rest. Wheat is 3/4 of a cent up to 3 cents lower. Brussels issued 687 TMT of soft wheat export licences this past week, that takes the 2013/14 marketing year total so far to 3.9 MMT versus only 1.8 MMT this time last year. EU barley export licenses are also well advanced at 2.2 MMT versus 1.4 MMT in 2012/13. Egypt say that they will only import 5.0-5.5 MMT of wheat in 2013/14, substantially less than normal. Jordan are in for 100 TMT of optional origin wheat for Mar/May shipment. 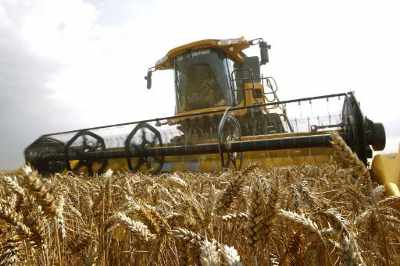 The HGCA say that the UK wheat harvest is 40% done, with yields only slightly below average at 7.6-7.7 MT/ha. Bushel weights are said to be averaging 76 kg/hl and proteins 12.8% but variable. The winter barley harvest is 99% done and the spring barley harvest 30% complete, yields on both are better than the 5-year average. Winter OSR is 70% harvested with yields below average at 3.2-3.4 MT/ha, although that is better than was feared. The German Farm Ministry estimate the wheat crop there at 24.9 MMT, which is significantly more than Toepfer's 24.18 MMT forecast from earlier in the week and last year's 22.3 MMT output. The Buenos Aires Grain Exchange say that the Argy corn harvest is over, producing a crop of 24.86 MMT, a 3.3 MMT rise on last year. Oil World estimate the global 2013/14 oilseed crop at a record 478.4 MMT, up 4.8% versus 2012/13. They have the world soybean crop up 6% at 282.5 MMT, the world OSR/canola crop up 3.5% at 64.8 MMT and the world sunflower crop up 13.2% at 40.2 MMT. The Russian grain harvest now stands just shy of the 60 MMT mark off 53.5% of the cultivated area. Wheat accounts for 39.1 MMT of that with yields averaging 2.84 MT/ha versus 1.99 MT/ha in 2012 and 2.93 MT/ha in 2011. Winter grains have already been planted on 2.2 million hectares in Russia for the 2014 harvest, versus 1.5 million ha a year ago and 1.2 million in 2011. 29/08/13 -- Soycomplex: The market drifted mostly a little lower in light consolidation from recent gains heading into a 3-day weekend which could prove to be pivotal for beans. Has the recent USD1.50 price rise put in a post harvest jitters top, or are we only pausing for a breather before moving higher? Whether the forecast weekend rains turn up may answer that question. The current precipitation outlook calls for about 85% coverage of 1/2 inch or more for almost the entire Midwest. Things are also seen turning much cooler by Labor Day on Monday. MDA CropCast cut their US soybean production forecast by 162 million bushels to 3.052 million versus 3.255 million from the USDA. In metric terms that's 83.08 MMT, up 9.3% compared to last year. They increased their forecast for Brazilian soybean production in 2013/14 by 720 TMT to a record 86.2 MMT, which sits comfortably in the middle of the range of other analysts recent estimates. China sold almost 80% of the 496 TMT of soybeans on offer in today's government auction. Grain.gov.cn said that China's soybean stocks are at the highest levels of the year so far at 6.3MMT. US weekly soybean export sales came in at net reductions of 3,200 MT for old crop and net sales of 868,700 MT, at the top end of trade ideas of sales of around 500-800 TMT. Unknown destinations (404,700 MT) and China (229,000 MT) were the main buyers. Actual shipments have all but dried up at 76,000 MT this past week. Sep 13 Soybeans closed at USD14.30, down 3 cents; Nov 13 Soybeans closed at USD13.68 1/2, down 4 1/4 cents; Sep 13 Soybean Meal closed at USD467.40, up USD4.10; Sep 13 Soybean Oil closed at 43.78, down 53 points. Corn: For corn, the USD5/bu mark is looking key. Having closed below that level for the first time in a front month since October 2010 in late July, we've only closed above USD5/bu twice since - on Monday and Wednesday this week. We've now also closed below the USD5/bu mark twice this week. 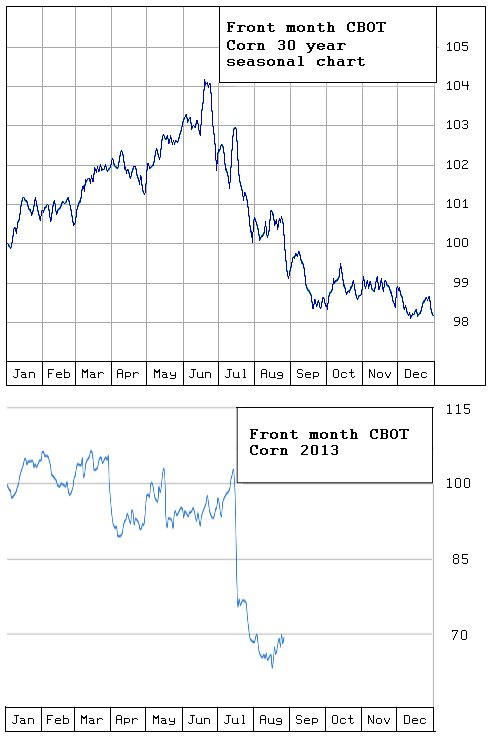 The seasonal trend says that the lows of the year in corn aren't normally set until the back end of the year. 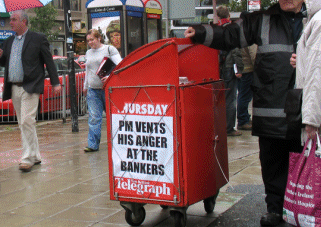 Weekend weather and Syrian developments could be crucial to where we go from here. MDA CropCast cut their US corn production forecast 292 million bushels to 13.544 billion versus the USDA's 13.763 billion. In metric terms that's a loss of 7.4 MMT to 343.9 MMT. That would also still be a record crop by some distance however and a rise of 32.5% versus last year. They raised Brazil's 2013/14 corn crop by 2.7 MMT to 73.6 MMT, but dropped Europe's by 1.1 MMT to 58.4 MMT. Ag Resource estimated the 2013 US corn crop at 13.819 billion bushels versus a previous estimate of 14.13 billion, using a yield estimate of 155 bu/acre. Taiwan's MIPA bought 60 TMT Brazilian corn for Nov 1-15 shipment. Weekly export sales came in at net reductions of 15,000 MT in old crop and net sales of 673,800 MT for new crop against trade estimations for sales of 300-600 TMT. Only 376,500 MT/week was needed to hit the USDA export forecast for 2013/14. The usual crop progress report due Monday will be delayed until Tuesday due to Labor Day. It will be interesting to see how much this week's heat has accelerated crop maturity. As of last Sunday only 70% of the crop was at the dough stage versus 79% normally and only 23% of the crop was dented versus 43% normally. Sep 13 Corn closed at USD4.97 1/4, down 7 cents; Dec 13 Corn closed at USD4.81 1/2, up 3/4 cent. Wheat: Without much of a storyline of it's own wheat remains clinging on to corn's coat tails. If corn can't hold above USD5/bu then it's difficult to imagine CBOT wheat trading at USD7/bu plus. US wheat remains priced out by EU and Black Sea wheat into non-traditional homes. Even so, weekly export sales of 551,300 MT were in line with trade expectations of 400-600 TMT. Regular buyers Mexico (137,800 MT) and Japan (131,100 MT) were the biggest takers, although new kid on the block Brazil (88,900 MT) also featured. As of last week’s report, sales of only 370,000 MT were needed to reach the USDA's export estimate. Egypt's wheat tender purchase of yesterday found Black Sea sellers at around USD20/tonne cheaper than US offers, and that is before much more expensive freight is added on. Egypt's supplies minister estimated his country's 2013/14 wheat imports at 5.0-5.5 MMT, well below the USDA's projected requirement of 9 MMT. Yesterday's order takes their public tender purchases for 2013/14 so far to just under 1.4 MMT. The supply minister said that Egypt now has enough wheat bought to last them through to January. South Korea bought a few medium sized cargoes of US and Canadian wheat. SovEcon raised their Russian 2013/14 wheat production forecast from 50.5 MMT to 51.7 MMT, which would be an increase of around 20 MMT versus last year's crop. They peg wheat exports at a relatively modest 14.5 MMT versus 11 MMT in 2012/13. MDA CropCast raised their EU soft wheat production forecast by 300 TMT to 134.9 MMT, up 6.6% on last year. They cut their Argentine wheat crop estimate by a similar amount to 11.7 MMT, still a 15.8% increase on 2012/13 mind, due to dryness and cold temperatures. Sep 13 CBOT Wheat closed at USD6.41 1/4, down 5 1/4 cents; Sep 13 KCBT Wheat closed at USD7.01, down 5 1/4 cents; Sep 13 MGEX Wheat closed at USD7.24 1/4, down 10 cents. 29/08/13 -- EU grains were mostly lower, in line with declines across the pond in US wheat and corn. The market appears to be struggling with the notion that whilst the world corn crop might be shrinking a little, it is still going to be record one and much higher than output in 2012. Nov 13 London milling wheat settled GBP1.85/tonne lower at GBP157.75/tonne, and Jan 14 was GBP1.50/tonne easier at EUR160.00/tonne. Nov 13 Paris milling wheat fell EUR1.00/tonne to EUR188.25/tonne. Note that May 14 Paris milling wheat ended at EUR189.50/tonne, making it around a GBP2.00/tonne discount to May 14 London feed wheat on a GBP equivalent basis. US soybeans are staging a fairly good attempt at a rally, but corn and wheat are getting left behind. MDA CropCast cut their world 2013/14 corn crop estimate by 5.8 MMT from last week to 924.7 MMT, even so that is still well over 100 MMT (almost 13%) more than output in 2012/13. They raised their EU soft wheat production forecast by 300 TMT to 134.9 MMT, close to Toepfer's estimate of 134.6 MMT of yesterday. The Russian grain harvest now stands at 59.4 MMT off 52.9% of the planted area. 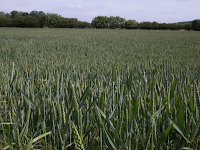 Wheat accounts for 38.9 MMT of that off 54.4% of the planned area. Wheat yields are up 43% on last year at 2.85 MT/ha, although down 3% on 2011. If we were to predict that this year's final Russian wheat crop would be up 43% on last year, not an outrageous assumption given that optimism is high that Siberia is forecast to produce a decent if not record crop this year, then we'd finish up with output of 53.9 MMT in 2013. A crop 3% down on 2011's would bring production to 54.4 MMT this season. It is starting to feel like the predictably cagey Russians may have been guilty of deliberately under-estimating this year's crop. SovEcon today increased their Russian wheat production forecast from 50.5 MMT to 51.7 MMT. Bloomberg reported today that the Egyptian Ag Minister estimated the 2014 domestic wheat crop at 8 MMT. In theory that would leave them needing to import more wheat in 2014/15, if they can afford it. Yesterday's Egyptian wheat purchase totalled USD78 million, according to Agrimoney. Israel bought 25 TMT of corn, 12 TMT of feed wheat and 12 TMT of feed barley of optional origin (possibly Black Sea region – most likely from Ukraine) for Sep/Dec shipment. Defra said that on farm wheat stocks as at the end of June 2013 were the highest since 2010 and a 23% increase on June last year. UK wheat stocks held by ports, merchants and co-ops were up 21% year-on-year and also the highest since 2010. Imported wheat stocks were more than double the level of June 2012, they added. A leading investment bank are advocating selling Nov 13 Paris rapeseed short, saying that the short-term up-trend has not broken the long-term down-trend. 29/08/13 -- Rapemeal prices on the continent lower today on ideas that recent price hikes have been overdone. Consumers appear well-covered nearby and end-user demand is seasonably light. 29/08/13 -- Not quite such a good match with the 30 year seasonal is this year's corn chart (click to enlarge), although the July/Aug dramatic slump is there for all to see. 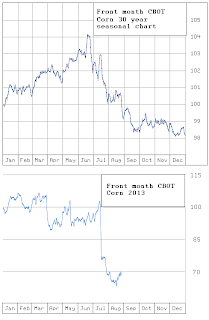 If the remainder of 2013 is to mirror a "normal" year then the corn lows won't be in yet. The front month closing low for 2013 so far was USD4.55 1/4 set on Aug 13th. Note that a little late August/early September post harvest rally (similar to the one we have just seen/are in the middle of) is also a feature of the 30 year seasonal chart. One interesting thing to note on all three corn, soybeans and wheat charts is that the magnitude of the peaks and troughs is much larger this year than "normal" over a 30 year period. In other words, the charts may look similar, but the difference between the highs and lows of the year in percentage terms versus the starting point of 100% is much greater than it has been in the past. I'd suggest that this is a recent trend, due in no small part to the large increase in volume being traded in Chicago these days due to the involvement of our old mates the funds and computerised in, out, shake it all about high frequency trading. The CME Group and CFTC would dispute that no doubt, praising the liquidity that it provides...blah, blah, blah. I will attempt to prove them wrong with tomorrow's chart. 28/08/13 -- Soycomplex: It was a choppy session, with front month Sep 13 beans posting decent gains. First notice day for that is Friday, and open interest in it has been dropping sharply of late so we can maybe expect some further extreme volatility before the contract expires in a couple of weeks time. There's a long weekend coming in the US, with Monday being Labor Day. Add to that the ever changing weather report, month end and nervousness over Syria and we could be in for further choppy activity over the next couple of sessions. There's also talk of beans in the Deep South being not far off being harvested in an effort to take advantage of the nearby premiums. The USDA announced the sale of 120 TMT of new crop US beans to China today. Nothing particularly startling there, remember that they need to buy around five cargoes every working day of the year if they are to import the 69 MMT of soybeans in 2013/14 that the USDA expects them to. The Chinese government are to auction off a further 500 TMT of state-owned soybeans tomorrow. Lanworth estimated the US 2013 soybean crop at 3.140 billion bushels with an average yield of 40.8 bu/acre. The USDA are currently at 3.255 billion and 42.6 bu/acre. Brazil (and indeed South America in general) are gearing up to produce a record soybean crop in 2014. Michael Cordonnier said that much better returns from beans than corn and the falling value of the Brazilian real mean that growers there will increase plantings by 4-6%, and maybe more this year. He estimates production next year at 85-87 MMT. Local analysts Agroconsult forecast a crop even higher at 88.4 MMT versus the previous record output of 81.5 MMT this year. Oil World forecast a South American soybean crop of a record 152.7 MMT, up 4.6% from 2012/13. Safras e Mercado recently suggested that production could hit 160 MMT. Yet again in the case of soybeans we therefore appear to have a "jam tomorrow" scenario developing. Trade estimates for tomorrow's weekly export sales report for beans are around 500-800 TMT. Sep 13 Soybeans closed at USD14.33, up 19 cents; Nov 13 Soybeans closed at USD13.72 3/4, up 2 1/4 cents; Sep 13 Soybean Meal closed at USD463.30, up USD7.40; Sep 13 Soybean Oil closed at 44.31, up 25 points. Corn: The corn market isn't displaying the same degree of conviction to the upside as beans, given that the recent warm and dry spell is occurring post-pollination. For corn we appear to have an "is the glass half full or half empty" type situation. Lanworth estimated US 2013 corn crop at 13.406 billion bushels with an average yield of 152.4 bu/acre, down 4% from their previous estimate and below the USDA's 13.763 billion and 154.4 bu/acre. Even though Lanworth are lower that the USDA, that's still a record crop. They estimated Ukraine’s corn crop at 25.6 MMT, down 5% from their previous estimate but also still a record output. Lanworth estimated China’s 2013 corn crop at 208.0 MMT, down 1% from their previous estimate, but guess what? Yep, that's still a record crop. 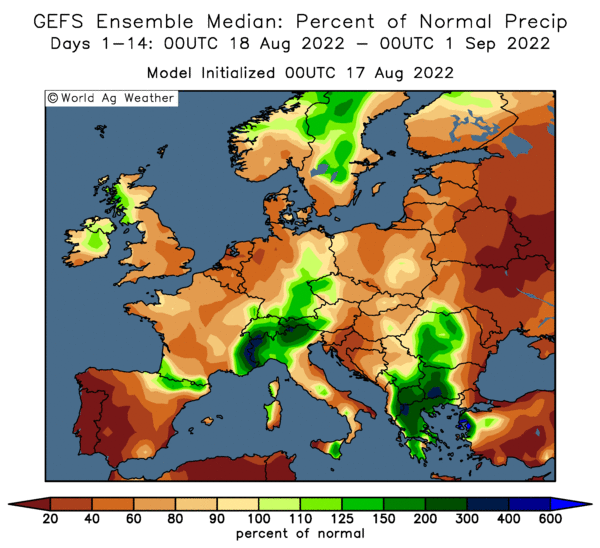 Both the GFS and European weather models are now calling for cooler weather this weekend through next week, although the respite might not bring much rain or last too long. "Mason City, Iowa, is expecting a high of 90 F Saturday, but 79 F on Monday, Labor Day. A couple more surges of cool, dry Canadian air are predicted in the Midwest next week. However, by Friday September 6th, hotter weather is expected to resume, when a ridge of high pressure strengthens in the Great Plains and expands east into the Midwest," said Martell Crop Projections. Weekly US ethanol production came in down a hefty 24,000 barrels/day versus last week at 820,000 bpd. Whether that is down to waning demand, downtime or tight corn supplies is immaterial - it still continues to indicate that the USDA have overstated demand from that sector in 2012/13. Crude was up sharply on both sides of the Atlantic for a second day as tensions between the West and Syria escalate. South Korea's Nofi bought 60 TMT of optional origin corn for Feb shipment. Asian buyers are expected to be busy booking corn for the New Year over the next week or so, although it will mostly be of optional origin. Brazilian analysts Agroconsult forecast corn production there falling from 80.3 MMT this year to 76.0 MMT next year as growers turn to soybeans. Michael Cordonnier said that corn prices in interior states Mato Grosso a long way from the ports are around or below the equivalent of USD2/bu. Trade estimates for tomorrow's weekly export sales report are around 300-600 TMT. Sep 13 Corn closed at USD5.04 1/4, up 4 1/2 cents; Dec 13 Corn closed at USD4.80 3/4, down 5 1/2 cents. Wheat: The wheat market remains a follower of corn. The USDA announced the sale of 119 TMT of US wheat to unknown, split 22 TMT of HRW and 18 TMT of SRW for delivery in 2013/14 and 49 TMT of HRW and 30 TMT of SRW for delivery in 2014/15. Egypt bought 295 TMT of hard wheat for Oct 1-10 delivery in their tender. They booked 60 TMT of Russian wheat, 60 TMT of Romanian wheat and the rest was of Ukraine origin. French wheat was comfortably out-priced and US wheat wasn't even offered. Japan seeks 120 TMT of feed wheat and 200 TMT feed barley via a SBS tender for Nov/Dec shipment. Tunisia bought 84 TMT of soft wheat and 75 TMT of feed barley in a tender. Rusagrotrans forecast the Russian wheat crop at 52.6-53.0 MMT, with exports at 15-16 MMT. They said that total grain exports in August will be 3.1 MMT, but will fall to 2.6-2.8 MMT in September due to hot competition from other countries on the Black Sea. Brazil announced that they will extend the duty free period on wheat imported from outside the Mercosur trade bloc to September 10th. They also increased the quota allowed in from outside this group from 2.0 MMT to 2.3 MMT. With frost problems in their own crop and Argentina's not due onto the market until Nov/Dec they may have to make further similar changes down the line. They've been active buyers of US wheat lately, topping the list of homes in the weekly export sales report for the last couple of weeks. Trade estimates for tomorrow's report are around 400-600 TMT. Toepfer estimated the German wheat crop at 24.18 MMT versus a previous estimate of 24.24 MMT and the 2012 wheat crop of 22.33 MMT. They placed the EU soft wheat crop at 134.6 MMT, up 7% versus 125.7 MMT in 2012. They have Romania's 2013 wheat crop at 7.44 MMT versus the 2012 crop of 5.75 MMT, Hungary’s crop at 4.93 MMT versus 3.94 MMT last year and Bulgaria’s crop at 4.95 MMT versus 4.56 MMT in 2012. A report on Reuters suggests that whilst official estimates for the French wheat crop this year are around the 36 MMT mark, private estimates are in the 37.0-37.5 MMT region (versus 35.6 MMT last year). Wheat harvesting in France, Germany and eastern Europe too is just about done. Sep 13 CBOT Wheat closed at USD6.46 1/2, down 4 1/4 cents; Sep 13 KCBT Wheat closed at USD7.06 1/4, down 1 cent; Sep 13 MGEX Wheat closed at USD7.34 1/4, up 4 3/4 cents. 28/08/13 -- EU grains were mostly lower, following a change in the latest US weather forecast to a cooler and wetter outlook for next week. At the close Nov 13 London wheat was GBP1.60/tonne firmer at GBP159.60/tonne and Jan 14 was down GBP1.95/tonne at GBP161.50/tonne. Nov 13 Paris wheat finished the day EUR2.50/tonne easier at EUR189.25/tonne (around GBP162.50/tonne equivalent). Toepfer trimmed slightly it's forecast for German wheat and OSR production, with wheat output cut from 24.24 MMT to 24.18 MMT and OSR from 6.04 MMT to 5.83 MMT. Even so, that still leaves wheat production up 8.3% on last year and OSR output almost 21% higher. This year's harvest is almost done and quality is "normal" they said. OSR oil levels are averaging around 42-43%, they added. Russia's grain harvest now stands at 58.8 MMT off 52% of the cultivated area. Wheat accounts for 38.8 MMT of that, more than last year's output even though the harvest is only just past halfway at 54% done. Wheat yields are up more than 42% versus a year ago. They've also harvested 11.4 MMT of barley so far off 60.6% of plan. Rusagrotrans estimate this year's grain crop at 91.6-92.8 MMT, with wheat accounting for 52.6-53.0 MMT of the total, barley a further 15.6-15.7 MMT and corn an additional 9.8 MMT. They have grain exports at 20-22 MMT, including 15-16 MMT of wheat, 2.5-3.0 MMT of corn and 2 MMT of barley. The Siberian presidential envoy is bullish on crop production prospects there following decent rains (which have delayed the harvest by 2-3 weeks). "I think that the harvest will be close to a record, above average that's for sure," he is quoted as saying. Rusagrotrans noted that September grain exports will drop to 2.6-2.8 MMT, from 3.1 MMT in August, as the country struggles to match cheap offers out of the Black Sea. Ukraine has exported 3.23 MMT of grain since the start of the 2013/14 marketing year (to Aug 27), up 16.2% versus a year ago. Wheat accounts for 1.5 MMT of that, along with 1.5 MMT of barley and 0.56 MMT or corn, according to Ministry data. Egypt are back in the market tendering for wheat, with the results expected later today. News wires suggest that the cheapest French wheat offers were around USD20/tonne more expensive than those out of Ukraine. They've bought 1.08 MMT of Ukraine, Romanian and Russian wheat in their last five tenders since they resumed buying again following a 5 month break. Tensions in Syria are also fresh in trader’s minds with Brent crude rising to a 6 month high and NYMEX crude up to levels not seen since May 2011. A Senior US official told NBC News "we're past the point of return" and that US air strikes against Syrian targets appear inevitable. "within days." Spain imported less than 4 MMT of wheat in 2012/13, according to the latest customs data. That's down 35% from 2011/12. Soft wheat imports were down from 5.5 MMT to 3.6 MMT, and should fall further in 2013/14 due to bumper domestic production. Ukraine said that farmers there have already planted 30% of the 2014 winter rapeseed crop. The local weather centre said that good rains in the forecast for the next few week will get winter sown crops off to a good start. The latest GFS model gives 150-300% of normal rainfall for almost the entire country in the next 14 days. Tunisia bought 84,000 tonnes of soft milling wheat yesterday morning on an optional origin basis for September through November shipment. 28/08/13 -- It's a weather market that we're in, and they can be more fickle than I want away, I love this club, plastic Manc Wayne Rooney. The latest forecast indicates a cooler and wetter outlook for the Midwest than what was predicted yesterday, and so we go lower. "Midwest showers are in the forecast due to a sudden westward shift of high pressure into the Rocky Mountains in the new outlook. "The large ridge of high pressure that has occupied the US heartland is predicted to move westward, opening the door for showers in the Midwest. At least .75 inch of rainfall is now expected in the northern and eastern Midwest along with sharp cooling next week. The normal weekly rainfall for late August is .80 inch. "The GFS model previously indicated a slow westward drift of high pressure, not the sudden retrogression now indicated. "Cool dry Canadian air would overspread the Midwest on Monday, dropping temperatures by 10 F . Mason City, Iowa, is expecting a high of 90 F Saturday, but 79 F on Monday, Labor Day. A couple more surges of cool, dry Canadian air are predicted in the Midwest next week," say Martell Crop Projections. Of course it's not all over yet. "However, by Friday September 6th, hotter weather is expected to resume, when a ridge of high pressure strengthens in the Great Plains and expands east into the Midwest," they add. Who knows what tomorrow, or even tonight, will bring? 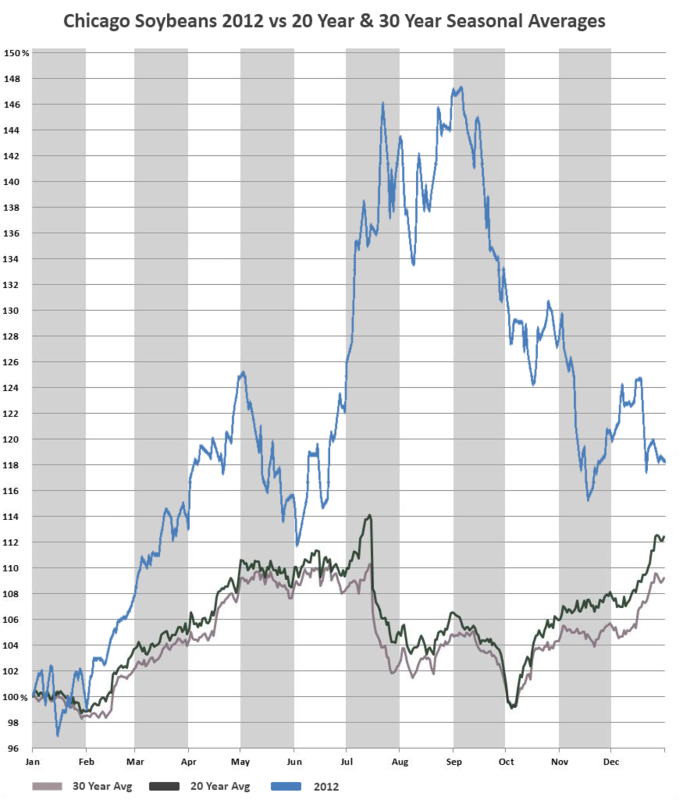 28/08/13 -- Following on from yesterday's soybean chart, I thought I'd take a peek at the 30 year seasonal chart for CBOT wheat and see how that compares with what we've seen so far this year. And here it is (click to enlarge). A large slice of hope for the wheat bulls out there, a rally in wheat looks overdue. If we are to conform to the pattern of a "normal" year then we can expect wheat prices to recover back to where they began 2013 by the end of the year - and that was in the USD7.50-8.00/bushel region. I can't really see it myself like, but they've done studies, you know, 60% of the time it works every time. 28/08/13 -- Rapemeal prices on the continent are mostly a little lower, consolidating from some steep gains in the past couple of days. The Morning Vibe - What's That Coming Over The Hill? 28/08/13 -- Brazilian agency Agroconsult say that the corn crop there will fall to 76 MMT in 2013/14 versus 80.3 MMT this year. 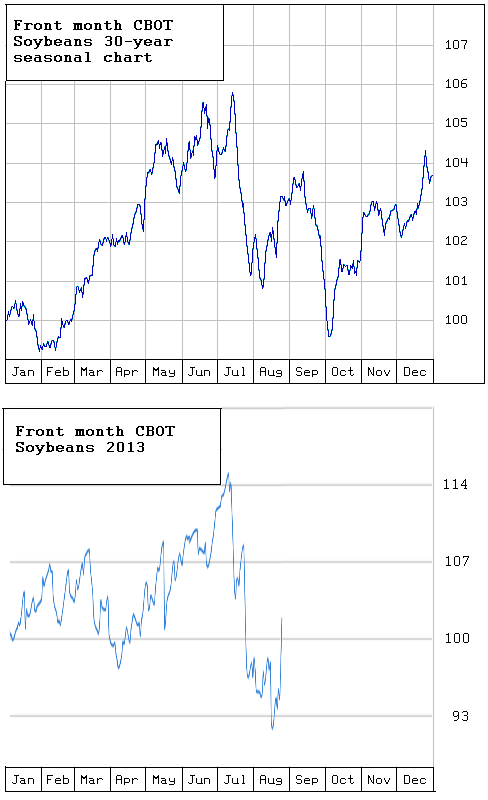 They have the soybean crop to increase from 81.5 MMT to a monster (and record) 88.4 MMT next year. That will test the creaky old Brazilian logistics even further. The overnight Globex grains are firmer, led by beans which are 12-16 cents higher. Corn is up 4-6 cents and the old ginger-haired stepson that is wheat has managed to limp along despite his leg iron and debilitating hemorrhoids to post gains of 3-4 cents. Crude oil is through the roof, with Brent at it's highest in 6 months and NYMEX sitting at it's best since May 2011 on jitters over a US-led gung ho strike against Syria. As oil goes up the pound goes down, with new BOE governor Markey Mark Carney expected to indicate in a speech later today that UK interest rates are set to remain at 0.5% for another 2-3 years yet. Toepfer have trimmed slightly their forecasts for German wheat and rapeseed production, although output of both is still well up on a year ago. For wheat they now go for a crop of 24.18 MMT versus 24.24 MMT estimated in July and output of 22.33 MMT last year. For OSR they now see the crop at 5.83 MMT versus 6.04 MMT last month and 4.82 MMT last year. Quality of both is pretty good this year, despite concerns to the contrary earlier in the year, they say. The Russian grain harvest now stands at 58.8 MMT off 52% of the cultivated area. Wheat accounts for 38.8 MMT off 54% of the planned area with yields averaging 2.86 MT/ha versus 2.01 MT/ha this time last year. Egypt are back in the market tendering for an unspecified volume of wheat for Oct 1-10 shipment. Ukraine and Romania might be the favourites once again. They've bought 1.08 MMT of Ukraine, Romanian and Russian wheat in their last five tenders since they resumed buying again following a 5 month break. Nov 13 London wheat was 20 pence lower in early trade, but currently stands 55 pence higher. Paris wheat is up a half to one euro. US weather remains the dominant force. QT Weather say "All in all there will be no significant rain relief for the next 10 days before a stronger system tops the ridge around Sept 7-8." China are to auction 500 TMT of soybeans from reserves again on Thursday. South Korea's Nofi have bought 60 TMT of optional origin corn in a tender for Feb delivery. Expect more South Korean action on corn in the coming days. 27/08/13 -- Soycomplex: Soybeans opened higher in follow through trade following yesterday's sharply higher close. However, some calls for a cooler and wetter outlook for the Midwest weather after the long Labor Day weekend holiday sent the market consolidating lower into the close. The trade is still debating the predictions made last week by the Pro Farmer crop tour. Essentially their US soybean crop production forecast of 3.158 billion bushels is around 3% lower than the USDA, thanks to a combination of a lower yield and also a smaller harvested area. That potentially drags US 2013/14 soybean ending stocks into the 130-150 million bushels area well below the USDA's current 220 million and barely above those of 2012/13. However, the tour is known to have a habit of trending towards the low side on yields. That said, another well known and respected analyst, Dr Michael Cordonnier, apparently lowered his estimate for 2013 US soybean yields to 41.0 bu/acre today versus a previous estimate of 42.0 bu/acre and the USDA's 42.6 bu/acre. 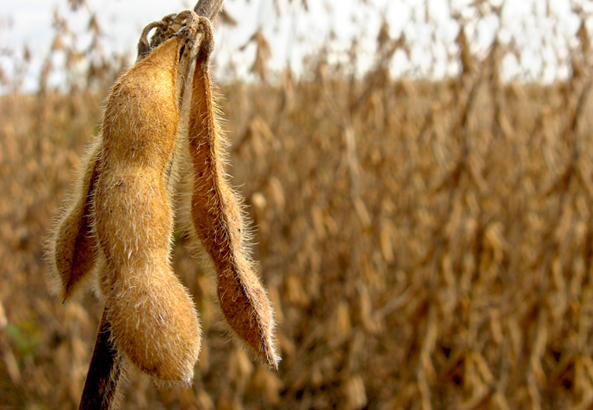 Citi Group said soybean prices may fall to around USD12.00/bu at harvest time. There's talk that Indonesia might quash the current 5% import tariff on beans in an effort to relieve domestic food prices. Indonesia 2013 soybean consumption estimated at 2.5 MMT in 2013 versus 1.9 MMT in 2012. Before the 2013 US harvest is even underway some are already getting the crystal ball out for next year. Farm Futures magazine estimated US 2014 soybean plantings at an all time high 78.75 million acres. South America could also ramp up plantings for next year. Sep 13 Soybeans closed at USD14.14, down 13 3/4 cents; Nov 13 Soybeans closed at USD13.70 1/2, down 19 cents; Sep 13 Soybean Meal closed at USD455.90, down USD2.70; Sep 13 Soybean Oil closed at 44.06, down 38 points. Corn: Corn gave up around 75% of yesterday's gains on the subtle change in the weather forecast for next week. Although the Pro Farmer crop tour's estimate for a US corn crop of "only" 13.46 billion bushels is 2.2% below the USDA's current forecast, it is still a record crop. Pro Farmer had US corn yields at 154.1 bu/acre, Dr Cordonnier today lowered his estimate to 152.0 bu/acre versus his previous estimate of 154.0 bu/acre and the USDA's 154.4 bu/acre. Citi Group estimated the 2013 US corn crop at 13.783 billion bushels, 20 million higher than the USDA. They have yield in the "mid to upper 150's" bu/acre. They said that US corn prices may trade be in the USD4.50-USD5.25/bushel range over the next year. South Korea Nofi are tendering for 40-70 TMT of optional origin corn for Feb shipment. Analysts said that South Korea corn needs are covered for January, but they still need to buy around 600 TMT of optional origin corn for Feb shipment. Taiwan's MFIG are tendering for 60 TMT of US, Brazil, Argentina, or South Africa corn for Nov shipment. South Africa’s 2013 corn crop was estimated at 11.513 MMT by CEC versus a previous estimate of 11.394 MMT. Corn harvesting in southern US states is fairly well advanced, with TX 52% done and LA 63% harvested. Farm Futures magazine estimated the US 2014 corn area at 94.11 million acres, down 3.4% versus 2013. "Some growers want to cut back on corn to improve rotations, after years of pushing that crop," they said. The weekly ethanol production report comes out tomorrow. Last week's grind was 844,000 barrels/day, suggesting that the USDA has overestimated corn for ethanol usage in 2012/13. Sep 13 Corn closed at USD4.99 3/4, down 16 cents; Dec 13 Corn closed at USD4.86 1/4, down 14 1/4 cents. Wheat: There wasn't much in the way of fresh news around for wheat, which closed mixed but mostly a little lower on all three exchanges. Minneapolis wheat was the strongest of the three on ideas that the recent erosion of spring wheat premiums may have been a bit overdone. The US spring wheat harvest is behind schedule and the current hot and dry spell may be hurting some of what is left in the field. What has been harvested so far is generally said to be of lower than normal protein, but with higher than expected yields. The Russian wheat harvest is past halfway, the Kazakh harvest is only just getting going after being delayed by rain. Yields of both are well up on year ago levels. Despite Kazakh grain yields currently being up 73% on last year, the Ag Ministry there only estimate this year's grain crop at 15.0 MMT versus 12.8 MMT a year ago. APK Inform said Ukraine has exported 145 TMT of wheat to Egypt between Aug 1-27 versus 129 TMT a year ago. After a couple of weeks on the sidelines Egypt's state wheat buyer issued a tender in the afternoon for October delivery. The results are expected tomorrow. Ukraine and Romanian origin wheat have been the recent victors. Japan seeks 51 TMT of food wheat via a SBS tender for Nov shipment. Tunisia seeks 84 TMT of soft milling wheat and 75 TMT of feed barley of optional origin for Sep/Nov shipment. Argentine analysts said that frost in Argentina over the weekend and yesterday came too early to affect their only just planted 2013/14 wheat crop. Further damage may have been done in Brazil though where the crop is more advanced. Sep 13 CBOT Wheat closed at USD6.50 3/4, down 4 cents; Sep 13 KCBT Wheat closed at USD7.07 1/4, down 1 cent; Sep 13 MGEX Wheat closed at USD7.29 1/2, up 1/4 cent. 27/08/13 -- EU grains closed mixed. London wheat was sharply higher after the markets here were closed for yesterday's Bank Holiday. London wheat closed with both Nov 13 and Jan 14 GBP4.45/tonne higher at GBP161.20/tonne and GBP163.45/tonne respectively, whilst Nov 13 Paris wheat closed unchanged, having done all its gaining yesterday, at EUR191.75/tonne. 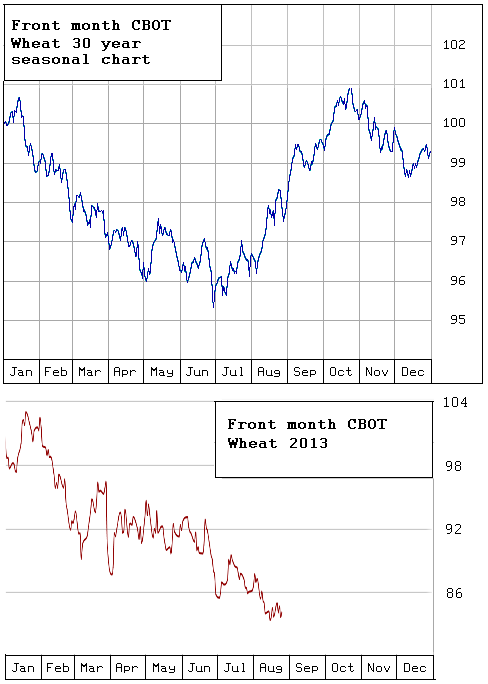 For front month Nov 13 London wheat this was the highest close since Aug 2nd. Wheat doesn't have a particularly bullish story of its own, so is instead attaching itself to soybeans and corn. It remains to be seen how long it can manage to do that for. The big question that everyone is asking themselves is does this mean that the bottom is in for wheat, or is this just a minor correction? The Russian Ag Minister forecast a wheat crop there of 50 MMT, up by a third on last year. Exports are estimated at 15 MMT, versus 11.3 MMT in 2012/13. He now estimates the total Russian grain output at 88-93 MMT, with exports of 20 MMT. Kazakhstan's delayed by rain grain harvest is at the 1.92 MMT mark, with yields up 73% versus a year ago at 1.35 MT/ha. Tunisia's 2013 grain crop is poor. They are tendering to import 84 TMT of soft milling wheat and 75 TMT of feed barley of optional origin for Sep/Nov shipment. They are expected to need to import 1.6 MMT of grain, mostly wheat and barley, as a result of drought earlier this year. Iran has said that its barter deal to swap electricity for wheat with Pakistan has been scrapped, without elaborating further. Pakistan have been buying imported Black Sea wheat quite heavily themselves of late. Talk of frost damage to Argentine wheat is premature, as the crop is only just in the ground and plants are too young to have suffered any appreciable set-backs say most analysts. Oil World raised its forecast for global rapeseed production to an all-time high 64.8 MMT, up 1.3 MMT from it's previous estimate. Production will be 20.8 MMT in the European Union, up 6.8% from a year earlier. Canada’s crop will be 6.5% larger at 14.8 MMT whilst the harvest in a bloc of former Soviet Union countries will be 41% higher at 4.5 MMT, according to a report on Bloomberg. 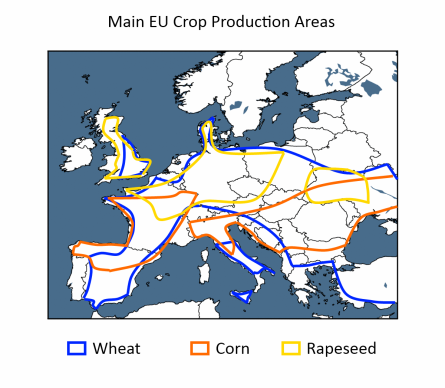 "In the EU, better-than-expected rapeseed harvests in Poland, the Czech Republic and Romania will boost the crop. The bloc’s rapeseed crushings will fall 1.3% as 'large and attractively priced supplies of sunflower seed and sunflower oil' place pressure on European rapeseed oil prices and damp demand. 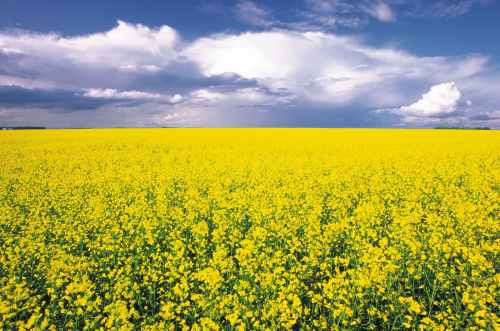 'Sluggish' demand from the biodiesel industry will further reduced rapeseed consumption, the report added. Pakistan bought 45 TMT of what was probably Ukraine origin rapeseed for immediate shipment. 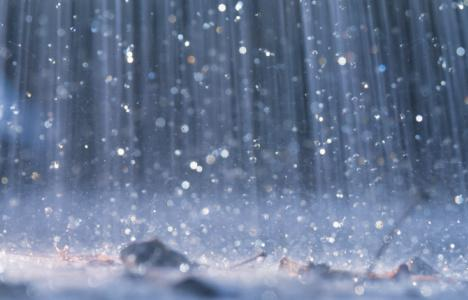 The deputy director of the Hydrometeorological Centre of Ukraine said that forecast rains will be beneficial for the sowing of winter grains and oilseeds. 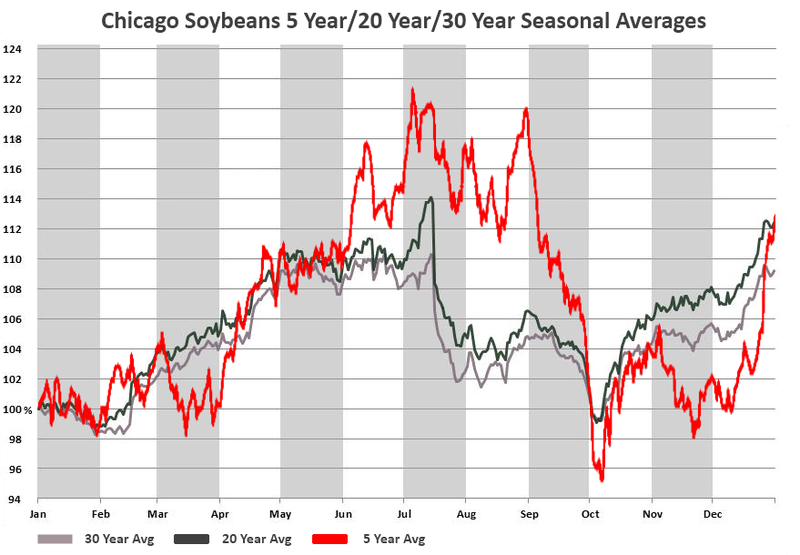 27/08/13 -- Here's the 30 year seasonal chart for front month CBOT soybeans along with how this year's performance compares underneath. There's a fair bit of similarity, particularly in relation to this latest move, don't you think? Both charts (click to enlarge them) start with the soybean price on Jan 1st being 100%, and show the subsequent fluctuations in prices as a percentage of that Jan 1st value for the remainder of the year. A July annual peak is traditionally met by a mid/early August low. The "normal" pattern suggests that beans typically regain around half, maybe a bit more, of the losses incurred from the July peak to the August trough in the second half of August and early part of September. If we were to do that again then we'd be looking at front month soybean prices in the USD14.50-15.00/bushel range. Note though that harvest pressure typically drags beans back down to below the early August low by the beginning of October. 27/08/13 -- Rapemeal prices on the continent are sharply higher following steep gains in Chicago soymeal values in the last two sessions. Unfortunately, as we were all on a day off here in the UK yesterday I don't have Monday's prices to offer a direct comparison, but front month Aug 13 is up EUR17/tonne versus Friday, with Nov13/Jan14 up EUR12/tonne. 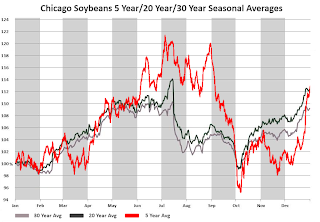 26/08/13 -- Soycomplex: Beans closed sharply higher, with the November contract coming within 4 cents of the daily 70 cents limit up at one stage, on US weather worries. "A large, stable dome of high pressure has taken control of the North-Central United States, increasing heat and moisture stress. Maximum temperatures in the low-mid 90s F are predicted for the next several days, 6-10 F above normal," said Martell Crop Projections. The market perception is that soybean yields are at risk of being the biggest loser here. Friday's Pro Farmer crop tour pegged potential US soybean yields at 41.8 bu/acre versus 42.6 bu/acre from the USDA. They have production at 3.158 billion bushels versus 3.255 billion from the USDA. It is noted however that possibly due to the fact that the crop was under-developed compared to normal at the time of the survey that production potential could have been particularly difficult to accurately assess this year. Traders say that the tour does have a tend to under-estimate the soybean crop anyway, having done so in 8 out of the last 11 years. Only time will tell if they have done so again this year. After the close the USDA cut good/excellent crop condition ratings from 62% to 58%. Poor/very poor was upped from 10% last week to 13% as of Sunday night. The proportion of the crop setting pods was 84% versus 90% normally. Weekly export inspections for beans came in at a very poor 2.461 million bushels. Sep 13 Soybeans closed at USD14.27 3/4, up 62 1/2 cents; Nov 13 Soybeans closed at USD13.89 1/2, up 61 1/2 cents; Sep 13 Soybean Meal closed at USD458.60, up USD25.40; Sep 13 Soybean Oil closed at 44.44, up 180 points. Corn: Corn also jumped on US weather concerns, with spillover strength from soybeans adding support too. Whilst Friday's Commitment of Traders report showed fund money cutting their short position in corn, they were still short 91,778 contracts for the week through to last Tuesday night. This obviously leaves the market vulnerable to an upside correction. Fund buying in corn today was estimated at a net 30,000 lots. Friday's Pro Farmer crop tour wrap up projected a US corn crop of 13.46 billion bushels, that's still a record although it's 300 million bushels below the current USDA forecast. Yields were averaged at 154.1 bu/acre versus the USDA's 154.4 bu/acre prediction. As with soybeans, some are noting that the under-developed corn crop may have led to yield potential to be under-estimated. The tour's track record on that front is that they have come in below final yields in 7 of the last 11 years. Japan customs data showed that Japan imported 997,627 MT of corn in June, down 12% from a year ago. Of that total 56.8% came from the US versus 78.6% a year ago. South Korea seek 600 TMT of optional origin corn for Feb shipment. After the close the USDA said that 59% of the US corn crop is now rated as being in good/excellent condition, down 2 points on a week ago. They have 70% of the crop at the dough stage versus 79% normally. Only 23% of the crop is dented versus 43% normally. Weekly export inspections were were 12.01 million bushels. Sep 13 Corn closed at USD5.15 3/4, up 20 1/4 cents; Dec 13 Corn closed at USD5.00 1/2, up 30 1/2 cents. Wheat: Continuing with the recent theme, wheat followed corn, which today meant a move higher. The hot and dry weather outlook for the Midwest also puts a proportion of the late developing US spring wheat at risk. Saudi Arabia bought 720 TMT of EU, North America, South America, and Australia hard wheat for Nov/Dec shipment over the weekend. China is getting it's first cargo of French wheat since the 2004/05 season as part of a 220 TMT purchase made a few months ago. After an initial flurry of buying US, Australian, Canadian and French wheat they've gone a bit quiet of late. So too have Egypt. South Korea's NOFI cancelled a tender to buy 60 TMT of optional origin wheat for December shipment citing high prices. Israel seeks 110 TMT of corn, 75 TMT of feed wheat, and 20 TMT of barley, all of optional origin for Sep/Jan shipment. As with corn, a sizable fund short position in CBOT wheat leaves the market vulnerable to short-covering and an upside correction. They were estimated as being net buyers of a net 6,000 CBOT wheat contracts today. Freeze damage talk in South America has now spread from Brazil to Argentina. CONAB estimated wheat production in the Brazilian state of Parana at 1.98 MMT versus 2.7 MMT last year. The USDA said that the US spring wheat harvest was 42% complete, up from 18% a week ago but down versus 54% normally. They increased the proportion of the crop rated good/excellent by one percentage point to 67%. Weekly export inspections were a fair 31.192 million bushels. Sep 13 CBOT Wheat closed at USD6.54 3/4, up 20 1/4 cents; Sep 13 KCBT Wheat closed at USD7.08 1/4, up 12 3/4 cents; Sep 13 MGEX Wheat closed at USD7.29 1/4, up 13 cents. 26/08/13 -- Whilst the London market was closed for the August Bank Holiday, French grains followed the lead of the overnight US Globex market, opening sharply higher and posting strong gains at the close. Nov 13 Paris milling wheat settled EUR6.25/tonne higher at EUR191.75/tonne, Nov 13 Paris corn settled EUR6.75/tonne firmer at EUR177.00/tonne and Nov 13 Paris rapeseed jumped EUR12.50/tonne to EUR389.00/tonne. US soybeans led the charge for a second session in a row on US weather concerns, and everything else just went with them wheat included, even though it lacks a really strong bullish storyline of its own. Saudi Arabia bought 720 TMT of hard wheat for Nov/Dec delivery over the weekend, which helped provide additional support. The origins were said to be EU, North America, South America, and Australia. News that the first French wheat shipment to China in around 9 years is expected to load 63 TMT of soft wheat at the northern port of Dunkirk later this week added a bit of extra bullish sentiment. The shipment forms part of a 220 TMT purchase made earlier in the year for Aug/Oct delivery. That was said to be China’s first significant purchase of French wheat since the 2004/05 season. 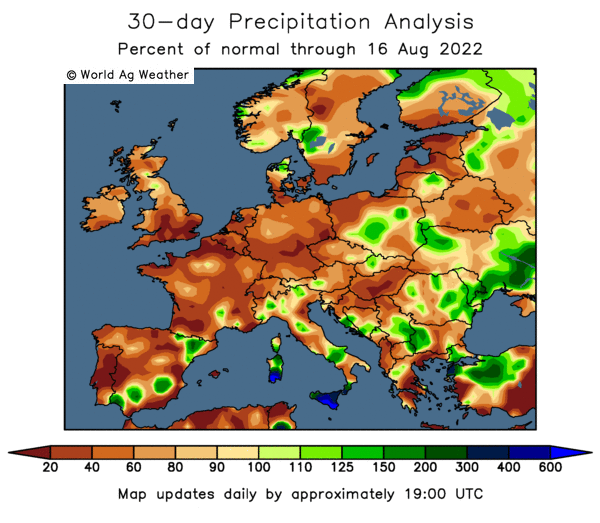 The EU Commission's MARS unit said that "since the beginning of July, major parts of Europe experienced weather conditions with above-average temperatures and below-average rainfall. Dry and hot conditions have particularly affected summer crop growth in northern Italy and parts of Hungary, Austria, Slovenia and Croatia. 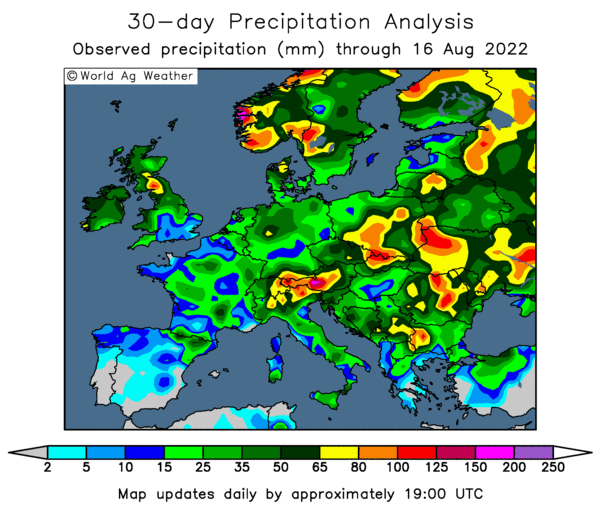 Abundant rainfall was recorded over large parts of the British Isles, Scandinavia, the Baltic countries, south- eastern France and the Alpine region," they said. "On balance, the EU-28 outlook for cereals remains favourable and well above both last year’s levels and the 5- year average, and largely confirms the forecast of July," they added. They marginally raised their forecast for the average 2013 EU-28 soft wheat yield from 5.69 MT/ha to 5.71 MT/ha, a 5.3% increase on last year. Barley yields were also tweaked higher, from 4.78 MT/ha to 4.80 MT/ha, a 9% increase versus 2012. The average OSR yield estimate was also nudged a little higher, from the 3.08 MT/ha forecast last month to 3.10 MT/ha, a 0.5% drop versus last year. Corn potential was cut from 7.22 MT/ha to 6.97 MT/ha, although that's still a 14.7% rise on year ago levels. For the UK they placed wheat yields at 7.73 MT/ha, 16.1% up on last year and a little above the 5-year average of 7.66 MT/ha. They have spring barley yields at 5.44 MT/ha and winter barley yields at 6.62 MT/ha, both up versus last year and the 5-year average. Average OSR yields in the UK were forecast at 3.32 MT/ha, a little lower than last year and the 5-year average. "Cold weather conditions characterised most of the growing season in the UK and Ireland, and the effects of these unfavourable weather conditions are still noticeable, although temperatures in July were above average. Moreover, heavy storms since the end of July have limited production rates," they noted. The Russian grain harvest now stands at 57.9 MMT off just over half (50.9%) of the planned area. Wheat accounts for 38.5 MMT of that total off 53.3% of the planned area with yields averaging 2.88 MT/ha, a rise of 43.3% versus 2012. There's talk of some possible freeze damage to newly planted winter wheat in Argentina to add to what appears to be confirmed production losses across the border in Brazil. Whilst this is grabbing some headlines it should be noted that both countries combined only produced around 15 MMT of wheat last year - what we would consider to be an average crop for the UK. Whilst there are still a few question marks over the size of the US corn crop then wheat could have arrested the slide, at least for now.